Two young urban dwellers, one a Blackfoot aboriginal named Cowboy and the other a Chinese Canadian newcomer named Chris, embark on a spiritual journey across traditional Blackfoot territory. Through thousands of years of ancient history guided by the wisdom of modern day elders, they ﬁnd the beginnings of the long road to reconciliation between indigenous and non-indigenous people. 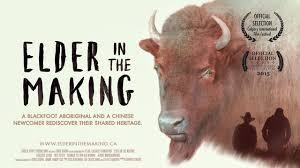 “Elder in the Making” is a feature documentary inviting all residents of North America to explore the tragic and hopeful history of their home. Through the journey of two unlikely travel companions, this ﬁlm uncovers our responsibility as stewards of the land and of the generations yet to come. Gifts of the Dark Wood. The DVD based series explores the proposition that our best help on life’s journey often comes from the most unlikely and misunderstood of places, a place known famously, or infamously, as the Dark Wood. Join us Tuesdays from October 11-December 6, either in the afternoon or the evening. This program is free to attend but please email Anna Greenwood-Lee to register.